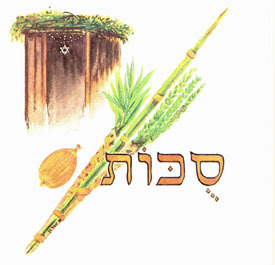 On this holiday, which occurs four days after Yom Kippur, Israel is commanded to dwell in make-shift booths for seven days and to bring together the four species of the Lulab cluster, the citron, the palm branch, the myrtle and the willow of the brook. These were waved as the worshippers encircled the Altar in the Temple. Today, the Synagogue Tebah replaces the Temple Altar. The complete Hallel is recited. Thus, the people leave their homes of comfort, and enter into the frail booths for seven days to remind us of our forty years of traveling in the desert, where we had no homes, and where the Lord protected us from all the dangers during the most difficult years. Sukkot is a very [happy] holiday. The people came from all parts of the country to celebrate in Jerusalem. Their jubilation was two-fold. Secure in the knowledge that their prayers were accepted on Yom Kippur, and extremely grateful for granaries and storehouses filled with the ingathering of all the produce of the fields. Everyone is commanded to rejoice during these seven days with their families, and thank the Almighty for all the blessings He has showered upon us. As we fulfill God's commandment of dwelling in the Sukah, of holding the Lulab, by refraining from work, and by rejoicing in the Holiday, we indicate our fear and our love of God. Image from Sassoon Manuscript #647 of Maqamat and Pizmonim used for the Sukkot festival services in Aleppo, circa 1850. After the joyful observance of Sukkot, the Lord pleads with Israel to remain in Jerusalem an extension of one more day to the Sukkot Holiday; a one day individual holiday by itself known as Shemini Hag Aseret. God is saddened at the thought of the people going back home. On this day, prayers were offered to the Lord to provide us with enough rainfall for our crops and for all other needs. At this point, the cycle of the weekly Sabbath Torah readings is completed, and immediately a new cycle begins. This day is also known as Simhat Torah, rejoicing in the Law. Unrestrained dancing with the Torah is accompanied with singing takes place. The Tebah is encircled seven times in a ceremony known as "Haqafot". Children of all ages participate. Candies, goodies, toys, and flags are generously distributed to children, thus instilling in them a love of Torah and of this holiday. The children overflow the Synagogues. Every inch of space is occupied. 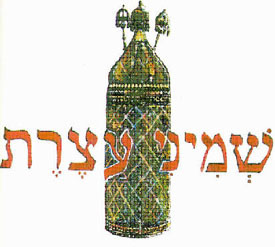 Image from Sassoon Manuscript #647 of Pizmonim used for the Shemini Asseret and Simhat Torah festivals in Aleppo, circa 1850.